Andrew Zimmern of “Bizarre Foods” did it. And now you can add Alex and Chickpea to the foodie VIP club. On our trip to Seoul, we stopped by the Noryangjin Fish Market and perused the hundreds of tanks, bowls and baskets full of every kind of seafood you can imagine (and some you can’t). 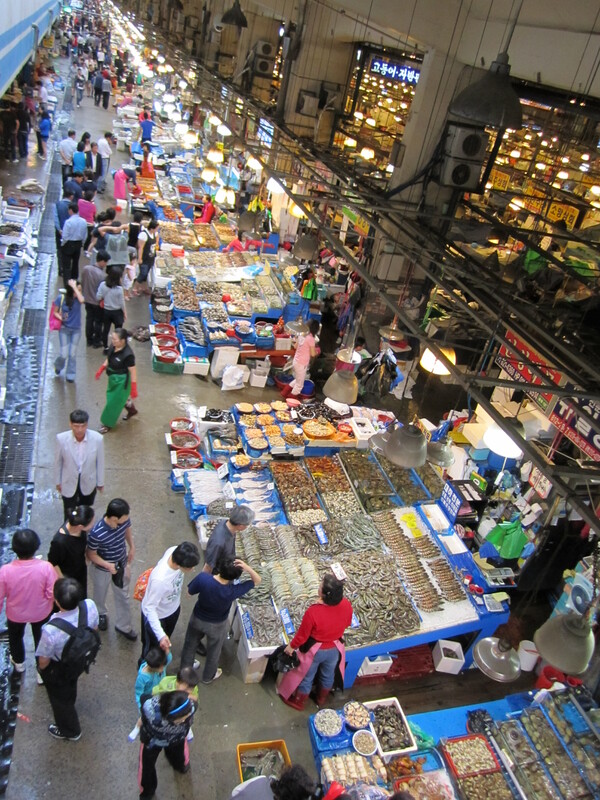 Noryangjin Fish Market is one of the largest in the world and is a must-see on any Seoul tourist’s list. After a quick tour of the warehouse, in which the vendors all tried to convince us to purchase all manner of bivalves, crustaceans, sea slugs and fish, we decided on our choice of seafood: two small crabs, two baby octopi and a handful of clams. Unsure of normal prices and seafood etiquette, I think we paid a bit more than the average Korean (30,000 won). But you’re paying for the experience, right? The vendor stuffed our “catch” in a black plastic bag, which was then grabbed by a woman and hurried upstairs. We followed her to a small restaurant where she cooked our purchase. Well, most of it. The live octopi, called “sannakji,” is just chopped up and served — still wriggling. You just grab it with your chopsticks, dip it in the sesame oil (for flavor and so the tentacles don’t stick to your throat) and chew … and chew … and chew. Any adventurous food lover — like the Travel Channel stars above — has to try it. While we waited for our seafood, we ordered some soju to steel our nerves. When the cook first brought out our little octopi, Franki, myself and our two friends just stared at the writhing mass of tentacles. Sensing our uneasiness on how best to tackle this dish, the cook grabbed a particularly large portion of the head in her fingers and stuffed it in our friend Jeff’s mouth. Korea is not for the food shy. We all immediately started eating our live catch, lest the cook shove it in for us. The octopus was not bad at all. Mostly flavorless without the sesame oil and, surprisingly, not fishy at all. By the way, Shannon (pictured here and in the video) has her own blog about life in South Korea: Daegu-ber. I’ve linked to it in the sidebar under “Korea-related Blogs,” but I also link to it here for your viewing pleasure. UPDATE: Turns out, Shannon blogged about Seoul the same day I did! Here is her post.